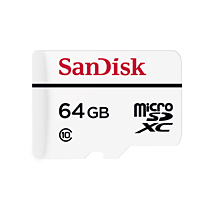 Built to stand up to hours of Full HD*video recording, the SanDisk High Endurance Video Monitoring microSDHC and microSDXC Cards provide the capacity, performance and exceptional reliability today’s home security and dashcams demand. They’re also protected against extreme temperatures, shock, water and x-rays**, so you can be confident the evidence is there when you need it. SanDisk High Endurance Video Monitoring Cards are available in capacities of 32GB and 64GB†. Specially developed for high endurance applications. **Card only. See www.sandisk.com/proof for additional information and limitations. †1GB=1,000,000,000 bytes. Actual user storage less. †† Based on Full HD (1920x1080) video content recorded at 26 Mbps to one device; Results, video support and performance may vary depending on host device, file attributes and other factors. † Registration required; terms and conditions apply.